Roof insulation installer, Aeroinsul, is an Isover approved installer for Aerolite ceiling insulation and other roof insulation types of products. Roof insulation installer, Aeroinsul, is an Isover approved for Aerolite ceiling insulation and other roof insulation types of products. Aeroinsul will issue you with a insulation certificate that comes with a 30 year guarantee on the thermal performance of the insulation product. This certificate states that the insulation installation complies with the requirements of SANS 10400-XA. Any ceiling insulation is guaranteed to add value to your home so have it done professionally. We offer a wide selection of ceiling insulation products for domestic use that can ensure your home keeps warm in the winter and cool in the summer. What’s more is that we have products that can cater to very specific requirements, and are always on the look-out for new industry-developments relating to roof insulation, new products, materials with potential for insulation as well as new ways to further enhance existing products. This allows us to maintain a competitive edge whilst adding greater consumer-value through superior products, specialised knowledge and reliable customer support. Many businesses require insulation to maintain a specific temperature within a room whilst not affecting adjacent rooms. This usually requires highly specialised wall and ceiling insulation, which is where we excel. We are specialists in all types of insulation and offer competitive rates on our products. What’s more is that we work with you in every step of the way to ensure that your unique needs are satisfied down to the finest detail. How Aerolite will work for you. There are many products on the market today. When choosing insulation, always look at the thermal resistance (R-value) of the product. Its simple …… the higher the R-value, the more insulation power you have! FACT: Aerolite has a Class 1 Fire Index Rating from the SABS (SABS 0177 Part III). FACT: Aerolite has been SABS tested and Approved (SABS 1381 Part 1). FACT: Aerolite carries NO health hazard. FACT: Aerolite does NOT contain asbestos. Which has significantly reduced the itch making the product more user friendly. Rolls are compression packed which enables the rolls to fit through a standard size trap door. We have a Social Responsibility to conserve energy as well as the environment. We also have a basic human right to live in a safe and comfortable environment. Signs of Global Warming are droughts, floods, melting polar ice caps, damage to the Eco system (fauna and flora), climatic changes, damage to the ozone layer through pollution from domestic and industrial sources. The National Building Regulations have been updated to include Part X, which addresses environmental sustainability, and Part XA, which establishes requirements for energy efficiency in new buildings and renovations. The application of this new legislation, which came into effect in November 2011, is good news for the environment and will help individuals, businesses and the country as a whole to save electricity. In home building, insulation is often considered a luxury and is overlooked, yet its primary purpose is to save energy and improve the home’s comfort. To insulate the ceiling and geyser system properly in a typical home costs less than 1% of the total per square-metre building costs and effective insulation is one of the few building materials that will, in effect, go on saving money over the lifespan of the home. A home without ceiling insulation typically loses and gains up to 35% of its heat energy through the ceiling. This can be reduced dramatically by installing insulation of the correct thickness. 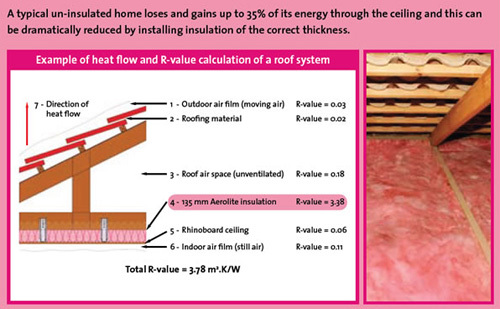 Think Pink Aerolite is a thermal and acoustic ceiling insulation solution which reduces the amount of energy required to maintain a comfortable living environment. It affords the homeowner a payback period of less than two years, with continued savings thereafter. Aerolite is produced from a combination of natural minerals such as silica sand, which is a sustainable resource, and up to 80% recycled glass, making this glasswool environmentally friendly. The product is also non-combustible, it offers excellent sound absorption properties and is easy to install. All building materials have an R-value, which is a measure of the product’s ability to resist the transfer of heat. Aerolite is manufactured in a variety of thicknesses to suit the insulation requirements for buildings in each climatic zone, in compliance with SANS 10400-XA. The table shows the R-value achieved by a given thickness of Aerolite compared to the estimated minimum required R-value for insulation in each climatic zone. We also supplies insulation packs for geysers and geyser pipes. A geyser typically accounts for about 35% of the average household’s electricity usage. With insulation, savings can be achieved on the amount of electricity the geyser consumes. The savings will vary depending on the geyser thermostat setting, the length of pipes insulated, and hot water usage. By using our Geyser Pipe Insulation Pack to insulate the hot water pipes, savings of up to 37% of the energy used by the geyser system can be achieved. By using the Geyser Insulation Pack and Geyser Pipe Insulation Pack together, savings of up to 58% of the energy used by the geyser system can be achieved. The resultant savings on energy costs deliver a payback on the investment in insulation within six months.